Never having owned a car with an ipod/iphone connection, I’ve been trained to listen to the radio whenever I have to drive anywhere. As a matter of fact, in my current car, you can’t actually turn the radio off, so unless you have a CD playing, you’re picking up musical airwaves. I want to be clear up font. I’m by no means suggesting that there aren’t any good artists around in many varied genres of contemporary music. Sure there are. But for a fair slice of the demographic, there’s an underrepresented genre. There have been many indie and alt. rock groups kicking around for several years, and The Black Keys and whatever Jack White’s current incarnation is, tend to be pretty safe bets, but what about new artists? Groups that have formed since 2010? They are out there. So, if anyone else is feeling depressed about not hearing a lot of rock music on contemporary radio stations, I’d like to give you a little hope. Also, I can understand the urge to call these bands retro or throwback, but I try to avoid that and instead think of this as new music inspired by a classic sound without it being an imitation. I suggest we try to call them rock bands (and I’d really liked to hear them on my bloody car radio every so often, if anyone can do anything about that). A lot of glitter and gusto. The Struts are probably the most well known of these three, and the only one of the bands that I’ve personally heard get any radio play (though I wonder if I can attribute this to the fact that I’m stateside, and these bands are all based in or around the UK). I think I found them on a rock genre Spotify playlist. In itself a bit lucky. I’m utterly bewildered at the range of contemporary music Spotify categorizes as rock. Not saying they’re bad songs, but a large percentage of them aren’t aren’t rock songs. Still they had these guys on there, so I shouldn’t complain. 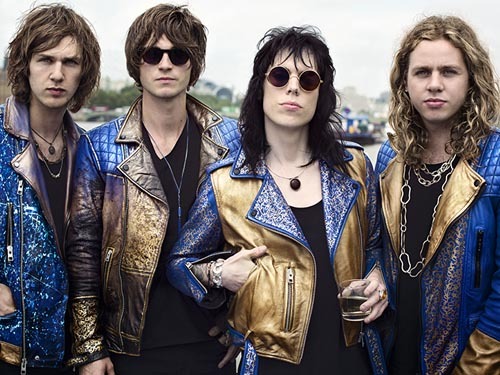 The Struts formed around 2010, but I didn’t find out about them until early this year. Once I had an eye out for them, I discovered that they would pop up on TV and even in conversations with people I’d never met before. The girl I was sat next to at a stand-up comedy show? She asked me if I had heard of The Struts. And I was all proud of myself because I had. Well, it turns out she had actually seen them play live. Their album, Everybody Wants (don’t be put off by the fact that at first glance the album art looks a little on the Smell the Glove side), is out and available on iTunes. I highly recommend it (obviously). This band I have been lucky enough to see in person. They were the opening band for none other than The Who during The Who Hits 50 Tour. Originally, when The Who were supposed to be playing the Staples Center in 2015, their opening act was going to be Joan Jett and the Blackhearts, but then Roger Daltrey got sick, the tour was postponed, and they had to find another band to open for them. When I got over my initial disappointment of missing out on seeing Joan Jett, I was curious to see what this Slydigs would be like. I figured if they had my favorite band’s stamp of approval, I should give them an even shake. The lead singer came out in a striped mod blazer, and I was instantly sold, but when they started playing: ohmigod, guys. So supremely excellent. And very much keeping in theme with the 60’s sound that the night was celebrating. We were only one song in before my dad and I looked at each other impressed and he said, “Wow. They’re really good. Like really really good.” And I completely agree. They had a great stage presence and a maniacal bass player that bounces around the stage (that’s the right, the bass player). They have a series of available singles as well as a 5 track EP and their music can also be found on iTunes. If you’re looking to delve into an even older style, this is the group to look up. Proper rhythm and blues. And ironically, the band members are all really young. The oldest ones are 20. That being said, they’ve been playing for a long time, and their musicianship shines through. I don’t know how they came up with the bright idea to put together a blues band, but I’m so very glad they did. Plus, they’ve done one of the best Beatles covers I’ve heard. Check out their version of “Come Together.” I’ll wait. I found The Strypes through Slydigs. I got to thinking, “okay, well, Slydigs is brilliant, there must be others like this, I have a computer, let me do a little research,” and I found The Strypes fairly easily as a “related artist.” Their music instantly reminded me of the band from the movie The Commitments. They have a raw power that drives their music, an irreplaceable element for a sustainable rock band. The sound isn’t always crisp, but you don’t want it to be. They’re skilled enough to recognize to be messy in just the right places. That the magic element that give you the blues sound. This entry was posted in Music and tagged album, artist, band, blue collar jane, blues, come together, could have been me, glam, kiss this, light the fuse, mod, Music, musician, rock, slydigs, stiff upper lip, struts, strypes, what a shame. Bookmark the permalink.